Our own family happens to celebrate Easter and renewal in spring and we are most familiar with Christian and non-secular Easter traditions and customs. Consider combining vegetables and using edible alliums and herbs for additional flavor, and using dressing on the side or else using smaller splashes of Extra Virgin Olive Oil (EVOO) or herb infused virgin olive oil (both of which are rich sources of Omega-9 oleic acid, a monounsaturated fatty acid), Canola Oil, Flax seed oil, Grape seed or Rapeseed Oil, Safflower Oil, Sunflower Oil (rich in Vitamin E), or even nut oils such as Walnut Oil. Peanut Oil is a better choice than oils with higher saturated fatty acid content; Sesame Oil is used in some dressings and Asian heritage recipes and a little contributes a lot of flavor so less can be used. Soybean Oil might be found as an ingredient used in mayonnaise, salad dressings, or some baking recipes so do a little label reading before using judiciously accordingly. In baking, consider ways to reduce the fat content by using some fat substitute options. A word of caution: in preparing baked goods, you CANNOT substitute reduced fat or “lite” mayonnaise for regular mayonnaise in older cake recipes that require baking where the regular mayonnaise provided both the fat and the emulsifier content, so please keep that in mind and look for alternative recipes. Commercially used fat substitutes incorporated into reduced fat or “lite” mayonnaise will not function the same way in baked goods as regular mayonnaise does. If any desserts feature chocolate flavor, choosing darker cacao content products as feasible is a good idea, and if using cocoa powder, using the natural processed unsweetened cocoa powder (not the alkali aka Dutch processed varieties) is preferable. Cacao, and thus the high content cacao (~70-75% or more) dark chocolate or natural processed unsweetened cocoa powder made from it, contain flavonoids, which are part of the polyphenol members of the group of health protecting substances known as antioxidants. You can best protect the antioxidant content in such cacao products by using baking powder, rather than baking soda, in preparing baked goods recipes. For example, when modifying an egg-free and milk-free recipe for say chocolate flavor “wacky cake” consider substituting 1 tsp of baking powder for 1 tsp. of baking soda. You can cut down on the alkali content of the recipe a bit and 1 tsp of baking powder actually contains 1/4 tsp of baking soda. Wacky cake can easily be made using either EVOO or canola oil in place of a solid fat (and you can easily substitute some legume or fruit puree for up to half of the fat) and you might even find you prefer the resulting flavor. For cakes or cupcakes, try using just a dusting of powdered sugar (any paper doily can serve as a stencil) or a fan of sliced fresh strawberries, etc., instead of higher fat and/or higher sugar content frosting or icing. When using nuts, it is often easy to toast them as feasible to bring out their flavor when adding to top a dessert or incorporating them into a Spring salad, etc. In baked fruit desserts, etc., using flavor-rich maple syrup (especially Grade B) as well as specialty honey, some molasses, or even brown sugar in place of some white granulated sugar can add a lot more flavor and require using less total sweetener. This approach works in some other baked goods recipes as well where sugar is not involved in the structural integrity of the dessert. If making yeast breads or quick breads, you can use more egg whites than yolks, and yeast breads can still be luscious if made with a lower fat content as well. 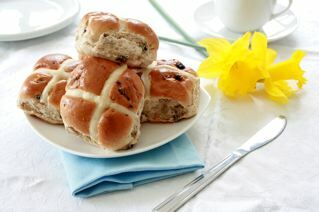 Two Easter time examples would be hot-cross buns, and then a “Maudy Thursday” baked (just before Easter) sweet (not savory) Braided Easter Bread, often filled with mixed diced candied citrus fruit and almonds plus possibly some a hint of lemon or orange zest and/or touch of anise which goes by different names in various cultures. Examples of those sweet Easter Bread names are Tsoureki of the Greeks; Kulich of the Russians; Paska of the Ukranians; Cheorig of the Armenians; various Babkas of the Polish (also made as a sweeter Easter break by the Ukranians); Kalacs of the Hungarians; Osterzopf (braid), Osterkranz (wreath), and Striezel (stacked braid) of the Germans and Austrians; or Czechs Easter buns (Velikonocni Pecivo); and in Italy and France various spellings are used for similar braided wreaths and other shapes (variations of Christmas time Panettone) including Casadille, Casatiello, Ciambelle, Ciambellone, dove shaped Columba, Pane di Pasqua, doll shaped Pupa con L’ouvo, etc. See a typical Braided Easter Bread wreath photo at all recipes and find a photo of a simple figure 8 design at the Red Star Yeast site. Using less egg yolks and two egg whites per removed egg yolk from the dough, and less butter (or substitute EVOO instead), and substituting 1 cup of white whole wheat flour for one cup of white flour in the recipe for one ring, you can make a healthier version of virtually any sweet Easter Bread recipe. For a lower sodium, lighter sweet Braided Easter Bread version, use a recipe that calls for yeast and not baking powder. As you know, the current 2010 Dietary Guidelines for Americans featured at choosemyplate.gov recognizes the vital nutrients found in whole eggs, including reasonable intake levels of egg yolk. 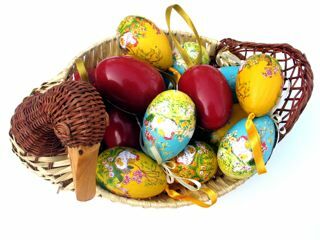 If, however, your diet does not allow egg yolk, then in the 3-5 “hollows” usually set aside for Easter Eggs in a Braided Easter Bread Wreath, you can hold the space using metal molds and then later add in colorful, food safe plastic or other composite Easter Eggs instead of real hard cooked eggs if desired. Keep in mind that any baked bread wreath with real eggs in the hollows will have to be stored in the refrigerator. If you oil the colored eggs before the wreath is baked, many bakers report that the eggs are less likely to crack. You can prepare a variation on the Fleischmann’s Yeast recipe for an Easter Egg Nest (either the conventional bowl method or bread machine method) if you desire. Try using some spices that tend to bring out the sweetness in some otherwise more bland recipes. Consider using allspice, anise, cardamom, cinnamon, cloves, ginger, mace (considered a milder form of nutmeg), and nutmeg itself. A homemade, lower fat or fat-free carrot cake would be a perfect way to use some of these spices for your springtime holiday celebrating as a 13 x 9 x 2 sheet cake or even cupcakes and doesn’t require light cream cheese frosting or icing, either! We can suggest a variation on Evelyn Tribole’s Carrot Cake recipe from her cookbooks “Healthy Homestyle Cooking” or “Healthy Homestyle Desserts” per se. You can include or exclude as you desire any walnuts, raisins, and crushed pineapple mentioned in the ingredients and also adjust the spice level when you prepare that recipe. This Easter, let the flavors of the food items and the feast for the eyes enhance the harmony of the time spent together celebrating the joy of renewal found in the season. Advance wishes for a Buona Pasqua!